President Muhammadu Buhari this evening hosted State Governors and Senators-elect of the All Progressives Congress (APC) to a dinner at the new Banquet Hall of the Presidential Villa, Abuja. 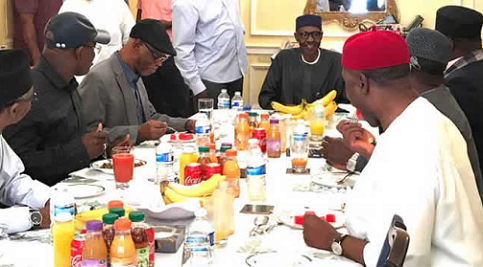 The News Agency of Nigeria (NAN) reports that those in attendance included the National Chairman of the APC, Comrade Adams Oshiohmole; Secretary to the Government of the Federation, Mr Boss Mustapha and other presidential aides. The governors of Kogi, Jigawa, Oyo, Kaduna, Kebbi, Zamfara, Borno, Yobe, Plateau, Osun and Lagos were also in attendance. Many Senators were also in attendance.